December 2nd and 3rd saw the return of the Annual Allchin Symposium on South Asian Archaeology, now in its fourth year. After being hosted at the University of Durham in 2015, the Symposium returned to Cambridge and the Trust this month with an action-packed line up spanning South Asian archaeology from Afghanistan to Sri Lanka, from the Neolithic to modern perceptions of the past in Indian cinema. As with other years, the Symposium kicked off with a Friday evening keynote lecture. Roberta Tomber of the British Museum spoke on ‘India’s Global Interconnections: looking west during the Early Historic period’. It was great to hear more about trade in the period of the Periplus, and about Roberta’s research tracking Roman pottery in India and Indian pottery at sites in Egypt and the Middle East. It was also particularly timely to hear more about the excavations at Pattanam (believed to be the site of Muziris), given recent media attention around the discovery. The discussion on the trade links between different countries reminded us of how historically interconnected our world is, and Roberta’s photos of an Indian storage jar found at the site of Berenike filled with 7.5kg of black pepper from South India helped get everyone in the mood for the Keralan dinner to come. After a wine reception at the McDonald Institute, the speakers, hosts, and attendees moved on to the Rice Boat restaurant where Sir Nicholas Barrington hosted a delicious dinner of appam and prawn moilee. The Saturday sessions began in the morning at the Trust with two presentations on diet. 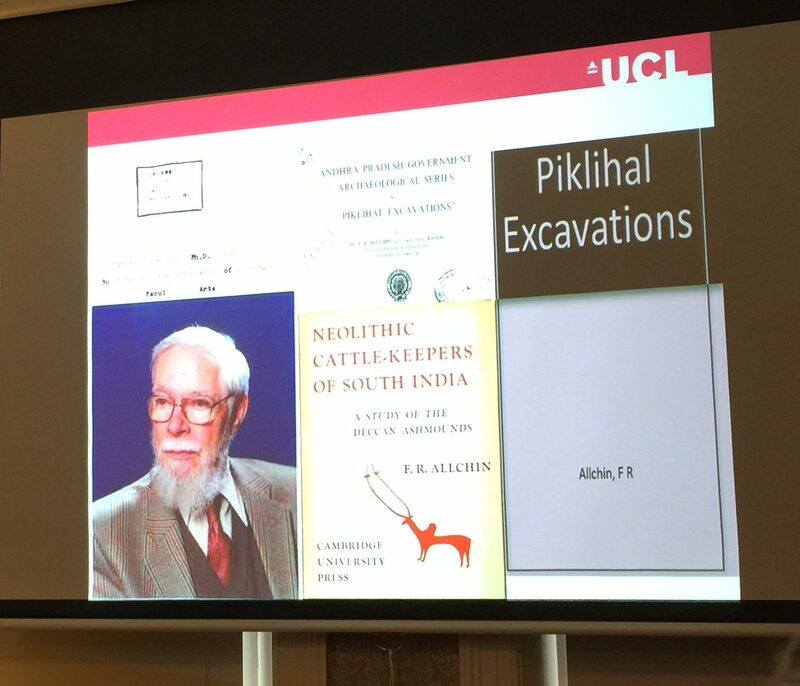 Charlene Murphy of UCL gave the first talk, titled ‘Piklihal Revisited: later Neolithic and Early Historic farming at a southern Deccan site’. Fittingly for the Allchin Symposium, the talk began by revisiting Raymond Allchin’s early excavations at Piklihal. Charlene discussing archaeobotanical data from section scrapings, concluding that pulses generally predominated though millets were important too. She contextualized the data from Piklihal with a macro view of the movement of millets and different food crops across the country. Akshyeta Suryanarayan from Cambridge spoke next, introducing the packed India Room to the pros and cons of ceramic residue analysis and her PhD research on Indus diet with her talk ‘What’s Cooking? Using ceramic residue analysis to investigate cooking and storage practices in the Indus Civilisation’. Her pilot study on a small number of vessels from Kalibangan and Mohenjo-daro showed evidence of plant-based fatty acids with possible mixing of ruminant dairy fats, with a few vessels showing a strong signal of degraded animal fats only. After a coffee break, the next session began within Robert Bracey from the British Museum who presented us with a puzzle in his talk ‘Coin ‘manufacture’(?) in ancient India: moulds and impressions.’ Robert discussed the mysterious find of 30,000 unused coin moulds at the site of Sunet, and what their function may have been. It was intriguing to find out about ancient forgeries as compared to modern reproductions, and what role these may have played in the economy. 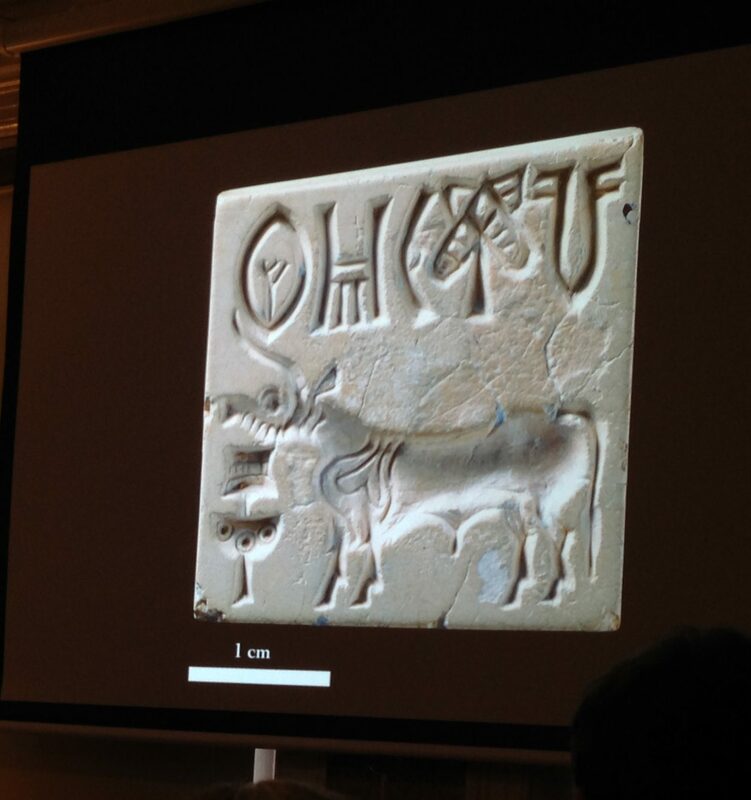 Adam Green from Cambridge spoke on ‘Bulls, bison and buffalos: For whom did Indus seal carvers carve?’ Adam conducted 3D miscoscopic analyses of 160 seals from Mohenjo-daro for his PhD to understand how they were made and identify communities of practice at the site. Alessandro Ceccarelli, also from Cambridge, gave a talk titled ‘Memories of cities and rural technologies: a morpho-stylistic and petrographic analysis of ceramic industries for understanding social reproduction and transformations at the twilight of the Indus urbanism’. Alessandro talked about doing thin section analyses of Indus and Painted Grey Ware phase ceramics from the sites of Alamgirpur and Bahola in India and identifying transmission of knowledge over time. After a lunch break for sandwiches, Hector Orengo from Cambridge discussed some preliminary results from his new postdoc with the TwoRains Project in a talk on ‘Setting up the scene: remote sensing and GIS-based topographic analysis applies to the analysis of palaeohydrography and site distribution in Punjab’. The scale of the landscapes Hector is working on was stunning. 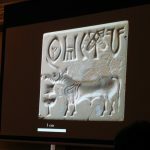 As with Akshyeta’s talk, it was interesting to hear about the application of newer scientific techniques that aren’t always used in South Asian archaeology. Continuing with the landscape theme, Jimbob Blinkhorn of the Max Planck Institute presented on ‘Geological landscapes, forager-farmer interactions and the symbolic frontier’. His photos of rarely seen rock art, including the oldest directly dated rock art in India, were particularly beautiful. 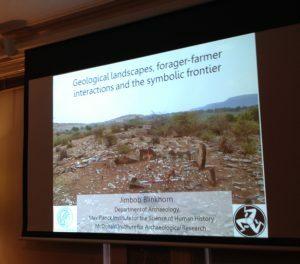 Jimbob used the changing imagery and the locations of the rock art, as well as megalithic cemeteries, to discuss interactions between hunter-gatherers and Neolithic farmers. Daniela de Simone, from the British Museum, also gave a visually aesthetic talk on ‘The material assemblage of the Nilgiri Mountains of South India: an overview of the British Museum collection’. The assemblage is funerary and includes inscribed bronze bowls, phallic representations, and ceramic vessels and figurines. The human and animal figures were engaging, and everyone enjoyed the contrast between the serious warrior figurines and the non-warriors with their big smiles. Wannaporn Rienjang from Cambridge concluded the session by speaking on her PhD research producing a ‘Chronological framework for relic cult practice in eastern Afghanistan’. Wannaporn has been working to use the coins included with Gandharan reliquaries to establish dates of the relic assemblages and their deposition. Following another coffee break, the last session of the day had two talks focusing on perception: Kaushalya Gunasena of the University of Exeter discussed ‘Beads, bangles and rings: perceptions of personal adornment’. Kaushalya has been looking at jewellery from the sites of Anuradhapura and Alagankulam and trying to understand the individual and societal choices behind them. Raminder Kaur from the University of Leicester also touched upon adornment as she gave the last talk of the day, a lighthearted look at ‘Mohenjo Daro at the movies: perceptions of the past’. The talk focused on the 2016 Bollywood blockbuster Mohenjo Daro and situated it within the landscape of Indian historical cinema to argue that the biggest problem with the film may not have been historical inaccuracy but a lack of originality and the use of cinematic tropes. Many of the criticisms levelled at it were themselves not very historically accurate. Raminder concluded that archaeology does indeed have a place in the Indian film industry, when depicted with sensitivity. 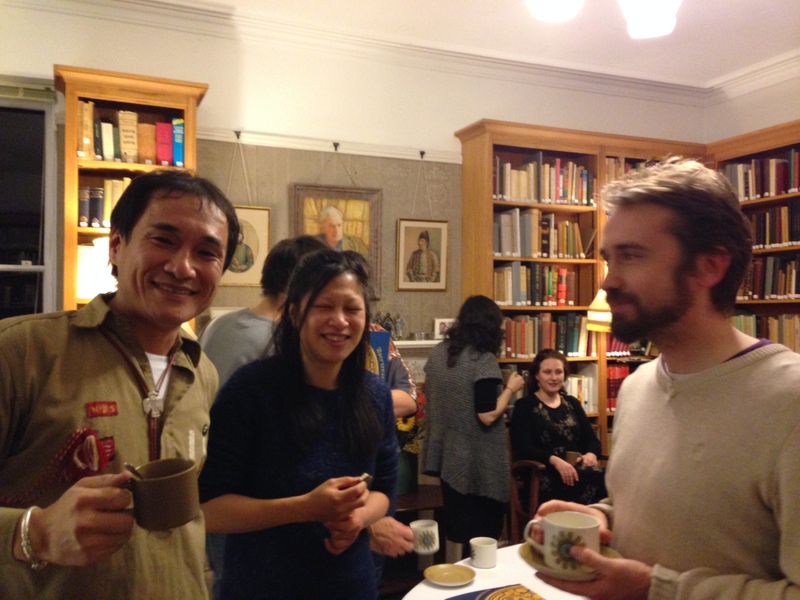 For another year, the Allchin Symposium successfully brought together South Asian archaeology PhD students and Early Career Researchers based in the UK to share their ideas and research in the field. 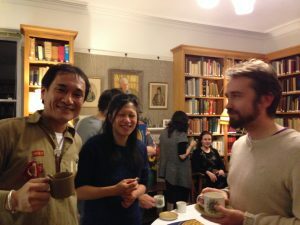 It was very much in the spirit of Raymond and Bridget, who through their teaching and co-founding of the Ancient India and Iran Trust, the European Association of South Asian Archaeology and the journal South Asian Studies, aimed to provide places and platforms for South Asian archaeologists. The symposium was not only enlightening, but also fun; it gave everyone the chance to make new friends and greet old ones, share thesis woes and swap suggestions and recommendations. It continues to build and strengthen links within the field and provide a forum, and for this we are all grateful. Many thanks to the organizers, Jason Hawkes, Cameron Petrie and Margaret Widdess; the Trust custodian, James Cormick; and the Trustees of the Ancient India and Iran Trust.